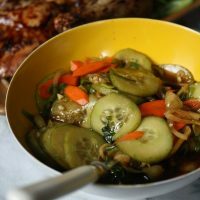 Combine the cucumber, carrot, onion, and scallion in a medium mixing bowl. Toss with the salt and let sit for 5 minutes. Add the remaining ingredients and stir to combine. Allow the cucumbers to marinate, mixing every 5 minutes, until softened, about 20 minutes.